The investigation of haematological malignancies (cancers of the blood, bone marrow and lymph nodes) represents a significant area of clinical and research activity. Our understanding of how and why blood cancers develop is underpinned by basic research into how blood cells develop normally and what happens at the earliest stage of malignancy. Research is closely aligned with clinical treatment so that patients receive the best diagnostic and therapeutic options based on their particular cancer. Blood cancers are categorised into three groups; Leukaemia, Lymphoma and Myeloma. Leukaemias are cancers that affect blood cells, mainly white blood cells and bone marrow. Many types of leukaemia are either 'acute' or 'chronic' based on how they behave. In general, acute conditions develop very quickly and need treating aggressively straight away. Chronic conditions usually progress more slowly and intensive treatment may not be needed straight away. The five main types of leukaemia are acute myeloid leukaemia (AML), acute lymphoblastic leukaemia (ALL), chronic myeloid leukaemia (CML), chronic lymphocytic leaukaemia (CLL) and hairy cell leukaemia. AML starts from young white blood cells called granulocytes or moncytes in the bone marrow. AML is rare with in the UK, aorund 3100 people diagnosed each year. The main type of treatment for AML is chemotherapy. Other treatments include radiotherapy, growth factors and bone marrow and stem cell transplants. Generally with AML around 20% of people will survive their leukaemia for 5 years or more after diagnosis. Younger people tend to do much better than older people. For example, in children aged 14 years or younger more than 65% will survive their leukaemia for 5 years or more after diagnosis. Whereas in people aged 65 years and over only around 5% will survive their leukaemia for 5 years or more after diagnosis. ALL is a type of blood cancer that starts from young white blood cells called lymphocytes in the bone marrow. It usually develops quickly over days or weeks and is the most common type of leukaemia to affect children but can also affect adults. ALL is rare with in the UK around 760 people diagnosed each year. Treatment for ALL is started quickly after diagnosis. The main treatment is chemotherapy. Other treatments include steroids, targeted cancer drugs, radiotherapy, growth factors and stem cell or bone marrow transplants. Generally for people with ALL, around 70% will survive their leukaemia for 5 years or more after they are diagnosed. Younger people tend to do much better than older people. For example, in those afed 14 or younger, more than 90% will survive their leukaemia for 5 years or more after diagnosis. Whereas in those aged 65 years or older, almost 15% will survive their leukaemia for 5 years or more after diagnosis. CML is often a slowly developing condition. 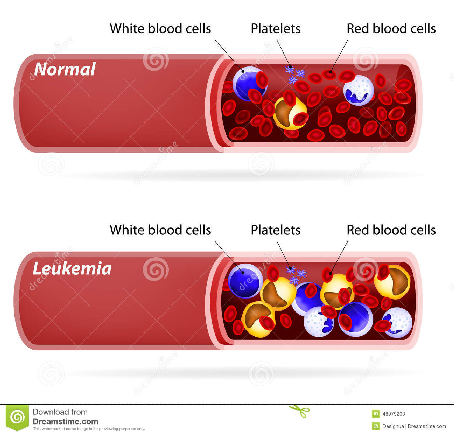 In chronic leukaemia the white blood cells are almost fully developed, but are not completely normal. The body makes too many of these abdoman white blood cells. In CML, the abnormal leukaemic cells develop from early blood cells called the myeloid blood stem cells and they become myelocytes. They are sometimes called granulocytes so sometimes this type of leukaemia is called chronic granulocytic leukaemia or CGL. Around 750 people a year are diagnosed with CML. It is more common in men than women. The main treatments for CML are biological therapies, chemotherapy, radiotherapy and stem cell or bone marrow transplant. There are no UK-wide statistics available for CML survivival. The following statistics are for people with CML in England, diagnosed between 2008 and 2010 from the National Cancer Intelligence Network. Generally for CML more than 70% of men and amost 75% off women will survive their leukaemia for 5 years or more after they are diagnosed. Younger people tend to have a better outlook than older people. For example, for people aged between 15 and 64, almost 90% will survive their leukaemia for 5 years or more after diagnosis. Whereas for people aged 65 and over, more than 40% will survive their leukaemia for 5 years or more. CLL affects the white blood cells called lymphocytes and tends to develop very slowly. Around 3516 cases of CLL are diagnosed in the UK each tear and is by far the most common type of chronic leukaemia. CLL is more common in people over 60 and is very rare in people under 40 with more men likely to develop it than women. Treatment may not be needed if the individual has very early stage CLL with no symptoms. If treatment is needed, chemotherapy will be use and they may also have radiotherapy. No UK-wide statistics are available for CLL survival. These following statistics are available for CLL diagnosed in England between 2008 and 2010 from the National Cancer Intelligence Network. Generally for people with CLL, around 70% of men and almost 75% of women will survive their leukaemia for 5 years or more after being diagnosed. Younger people tend to do better than older people. For example, for those aged between 15 and 64, more than 80% will survive their leukaemia for 5 years or more after diagnosis. Whereas for those aged 65 or older, more than 60% will survive leukaemia for 5 years of more after diagnosis. Hairy cell leukaemia is a rare type of chronic leukaemia. It develops slowly from white cells called B lymphocytes. Although often easier to treat, it is similar to other types of chronic leukaemia in how it develops and how it affects the individual. Around 220 cases of hairy cell leukaemia are diagnosed each year in the Uk to make it one of the rarest types of leukaemia. There are different treatments for this leukaemia and the individual may need just one or a combination of treatments. The main treatment is chemotherapy but they may also have rituximab (a biological therapy), surgery to remove the spleen or interferon (a biological therapy). No UK-wide statistics are available for hair cell leukaemia survival. The following statistic is available from a single area of England. Generally, around 90% will survive their leukaemia for 5 years or more after diagnosis. Lymphoma is a type of blood cancer that affects the lymphatic system, which is an important part of the immune system that produces and transports white blood cells around the body. It also removes waste products from the blood. There are two main types of lymphoma; non-hodgkin lymphoma and hodgkin lymphoma. Hodgkin lymphoma was named after the doctor who first recognised it and under the microscope they contain cells called Reed-Sternberg cells. Non-hodgkin lymphomas look different under the microscope and do not contain Reed-Sternberg. It is important that doctors know the difference between the two type of lymphomas as they are two different diseases. Although they are very similar in many ways, the treatment for them is not quite the same. There are more than 60 different types of non-Hodgkin lymphoma (NHL) and they can behave in very different ways. As the lymphatic system runs through the whole body, NHL can occur just about anywhere. The types of NHL. can be classified in several different ways. One way is by the type of cell affect. 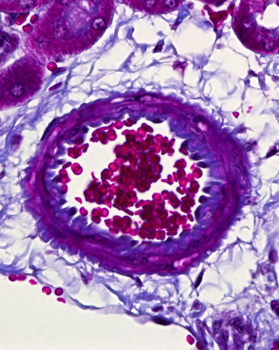 NHL affects certain white blood cells called lymphocytes. Two types of lymphocytes can be affected - B cells and T cells so there are B cell lymphomas or T cell lymphomas. Around 13,500 cases of NHL are diagnosed each year in the UK. The main types off treatment for NHL are chemotherapy, radiotherapy and biological therapy. Some people only have one type of treatment, others need a combination of treatments. Generally for people with NHL in England and Wales, about 80% will survive their cancer for 1 year or more, 70% can survive their cancer for 5 years or more and 65% can survive their cancer for 10 years or more after they are diagnosed. In Hodgkin lymphoma, it is cells in the lymph nodes that have become cancerous. Only about 1 in 5 lymphomas are Hodgkin lymphomas and around 2100 people are diagnosed in the UK each year. The World Health Organisation (WHO) classification systems puts lymphoma into 2 main groups; classical type and nodular lymphocyte predominant type. There are 4 types of classical lymphoma; nodular sclerosing, mixed cellularity, lymphocyte rich and lymphocte depleted. Nodular sclerosing is the most common type of Hodgkin lymphoma in the UK with nearly 60% being this type. The main type of treatments are radiotherapy, chemotherapy, steroids and high dose chemotherapy with a stem cell or bone marrow transplant. Some people need only one type of treatment and others need a combination of treatments. Generally, for people with Hodgkin lymphoma in England and Wales, around 90% will survive their cancer for 1 year or more, almost 90% will survive their cancer for 5 years or more and nearly 80% will survive their cancer for 10 years or more after diagnosis. 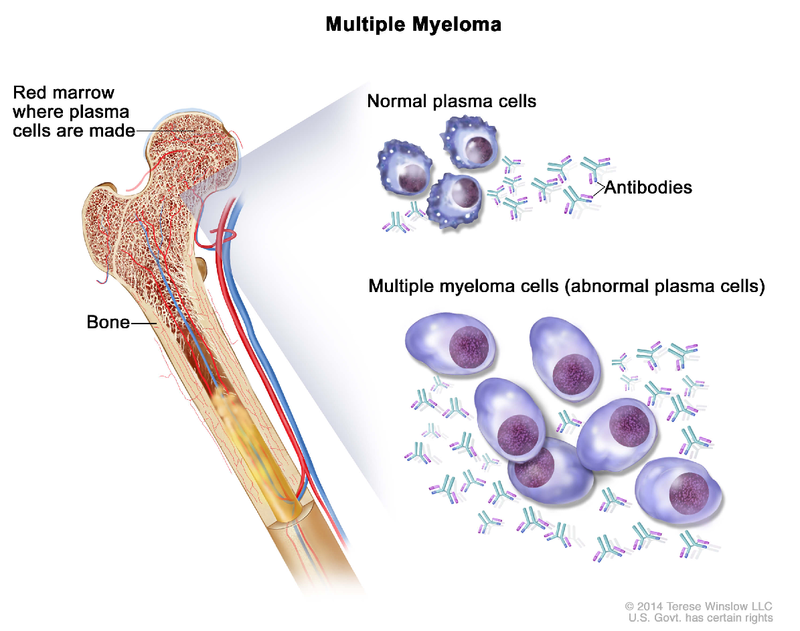 Myeloma is a type of cancer that develops from cells in the bone marrow called plasma cells. Myeloma can develop wherever there are plasma cells so it can be anywhere there is bone marrow, including the pelvis, spine and ribcage. As it can occur in several places in the body, it is often called multiple melanoma. Around 5,500 people in the UK are diagnosed with myseloma each year and the risk increases with age. It is very rare in people under 40. The main treatments for melanoma are chemotherapy, steroids and biological therapy. They are often used in combination. Generally for people with myeloma in England and Wales more than 75% will survive their myeloma for a year or more, almost 50% will survive their myeloma for 5 years or more and almost 45% will survive their myeloma for 10 years or more after diagnosis. This trial identified a single point mutation in JAK2 in many patients with myeloproliferative neoplasms, and validated a molecular diagnostic test, which is the first screening test to be introduced worldwide. A large clinical trial of over 1,000 patients with a myeloproliferative disorder called essential thrombocythaemia is taking place to assess the efficiency of different combinations of drug treatment. Myeloproliferative disorders are a group of diseases in which the bone marrow makes too many red blood cells, white blood cells, or platelets. Researchers have discovered that many people with these disorders have a particular genetic mutation affecting an enzyme, called JAK2. This enzyme has an important role for carrying messages within cells but, in the case of these disorders, the mutation causes too many new blood cells to be produced. The finding means that patients can be offered different treatment depending on whether or not their disease has been caused by the mutation.